I couldn’t sleep last night because of this book. Which is strange, because I read it last December. I can’t tell you why it rushed back to me all of a sudden. But I can tell you how it made me feel. I couldn’t sleep because each time I closed my eyes all I could see were the vast rolling waves. It wasn’t just a dark ocean; it was a menacing one. I was scared. I was scared of that black, endless ocean. And the sharks. Oh man, the sharks! They were enough to strike terror in one’s heart. I know I put this in the Book Reviews category, but it isn’t really a book review. It’s more of a “this book made me feel something and I want to share it” sort of thing. Certain books leave an imprint on my mind, and this book is one of them. When a book doesn’t let me sleep at night, I know it’s good. When it doesn’t let me sleep almost a year after I’ve read it, I know it’s really good. And when I can see the ocean every time I close my eyes, and I can feel myself moving because of the waves tossing and turning and pitching below me, and I can feel the strength of that marlin, I know it’s really really good. Actually, no – it’s more than that. It’s powerful. I guess what I’m trying to say here in a sort of roundabout way is that a book doesn’t necessarily have to be long and fancy to be good. 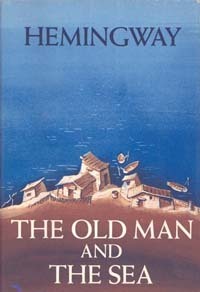 The Old Man and the Sea is 127 pages long. It’s not even really a novel. It’s a novella. But I don’t think I will ever forget it. Hmm. I don’t think this is coming across the right way. I’m not trying to show that I’m afraid of sharks. I guess I’m trying to show that I’m in awe. In awe of the ocean, and all the creatures that live there. And I didn’t really realize that until I read The Old Man and the Sea. It wasn’t a perfect book (no book is – gasp! ), but it was beautiful. And it made an impact. To be perfectly honest, I don’t think I’m doing the ocean or the book justice right now. I feel like I’m just rambling and none of this actually makes sense. So I’ll stop. Right now. And hope that you take away something meaningful from this post.